On 'Late Show,' The Spotlight Was Just Out Of Reach For Jeb Bush : It's All Politics The GOP candidate was friendly and warm, but he wasn't energizing, or even the center of attention. At one point Colbert riffed: "Oh, you were so close to getting [the audience] to clap!" 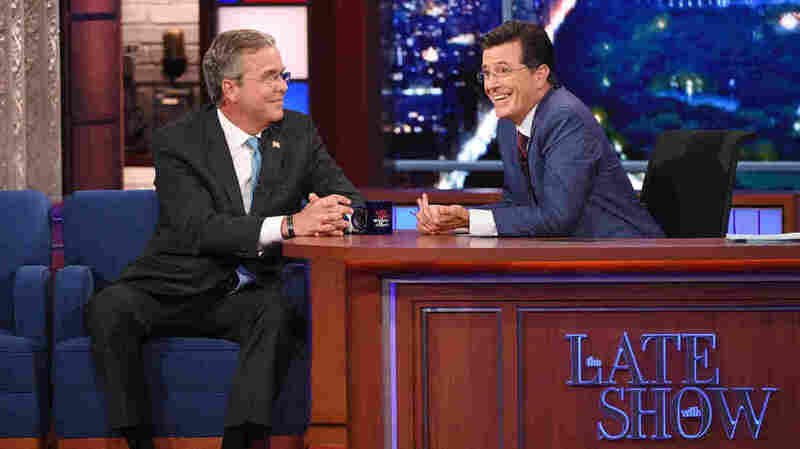 Stephen Colbert (right) talks with Republican presidential candidate Jeb Bush during Colbert's debut as Late Show host in New York. In his appearance on the first Late Show to feature new host Stephen Colbert on Wednesday night, Jeb Bush seemingly had an opportunity to finally generate some much-needed energy. But for the most part, he did not. Almost as soon as he took his seat next to Colbert, the conversation quickly moved to someone other than Bush — an awkward shift in focus that happened over and over during the interview. It started with that other front-runner, Donald Trump — the one who has been at no loss for energy. "You are, with one exception aside, which we'll get to later," Colbert told Bush, "the front-runner for the Republican nomination. Odds-on bet. Odds-on bet." The two laughed, but it was awkward. Bush quickly moved to talk about why he should be president. "I think we're on the verge of the greatest time to be alive," he told Colbert. "But our government isn't working." Bush said the federal government is "not operating on all cylinders." He said a Jeb Bush presidency would help Americans rise out of poverty and give the middle class, or "the great middle" as he called it, a pay raise. But as soon as he started making his case, the conversation shifted to a politician more famous than he: President Obama. Colbert asked Bush if he, as president, could help change a political climate that has become a blood sport, with Republicans bashing the president at every turn. "I don't think Barack Obama has bad motives," Bush replied. "I just think he's wrong on a lot of issues." It was a strong line, and just as the audience started a round of applause, Bush spoke again, stifling it. Another awkward moment. "Oh, you were so close to getting them to clap!" Colbert riffed. In a way, that line could serve as a metaphor for Bush's entire presidential campaign so far. Bush continued to make his case for civility in national politics. He said he wants to change a culture in which you're constantly forced to argue that "the other side is the devil." "You can be friends with people that you don't agree with on everything," Bush told Colbert. "We have to restore a degree of civility." Bush then spoke briefly of his achievements reforming public schools in Florida. But again, before he could spend any more time talking about himself, the conversation moved to someone else: his mother. Colbert asked Bush about the now-famous video of Barbara Bush saying that her son Jeb really shouldn't run for president. Bush responded with a smile, "Oh, she's just joking." And then they started talking about another member of the Bush family, Jeb's brother, George. "In what ways do you politically differ from your brother George?" Colbert asked. "I'm obviously younger, much better looking," Bush replied. He then said he thinks his brother allowed Republicans in Congress to spend too much money, and that he would be more fiscally conservative. He pointed out that in Florida, he earned the nickname "Veto Corleone," a riff on the Vito Corleone character in the Godfather book and film series, because he vetoed more than 2,500 line items in Florida's budget. It's a line Bush has been trying to use for some time, and it almost closed out his appearance. But just as Colbert had to end the segment, he commented not on Veto Corleone, but on Vito Corleone: "You know, he is an antihero in that movie." Bush giggled, smiled, shook Colbert's hand and rose to leave the stage. His appearance ended as it had begun, with the focus somewhere other than on himself. A previous version of this post misattributed a quote. It was Jeb Bush, not Stephen Colbert, who said, "I don't think Barack Obama has bad motives. I just think he's wrong on a lot of issues."